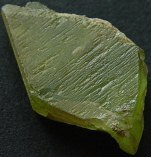 The SPHENE crystal is externally slightly damaged. 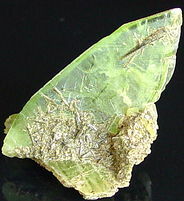 The SPHENE crystal is externally undamaged. 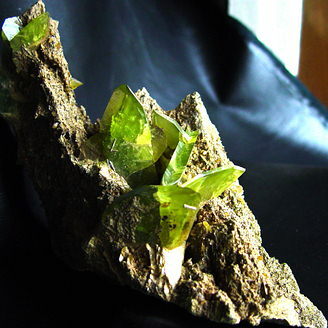 Group of Sphene crystal on matrix. 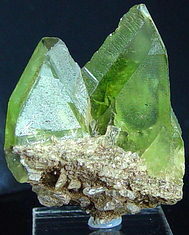 The SPHENE crystals are externally undamaged. Environment: Magmatic, metamorphic and hydrothermal rocks. Locality: Laacher See and Eifel, Germany. Madagascar, Switzerland. Color: reddish brown, gray, yellow, green, or red. Optical Data: Biaxial (+), a=1.84-1.95, b=1.87-2.034, g=1.943-2.11, bire=0.1030-0.1600, 2V(Calc)=68-82, 2V(Meas)=20-56. Dispersion r > v extreme. Pleochroism (x): colorless, greenish yellow, colorless, or yellowish brown. 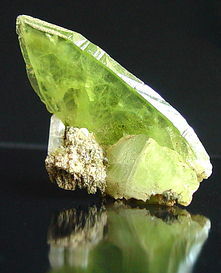 Pleochroism (y): colorless, pink, greenish yellow, yellowish brown, or yellowish green. Pleochroism (z): colorless, pink, reddish orange, pale yellow, or grass green. й 1987 - 2018 gggems.com All rights reserved.